Vancouver MP Joyce Murray is joining the federal Liberal leadership contest with a daring call for co-operation with other progressive parties in the next election to ensure defeat of Stephen Harper’s Conservatives. Murray says she believes Liberals, New Democrats and Greens should have the option of conducting run-off nominations to choose a single candidate in tightly contested ridings where a united progressive front would guarantee defeat of the ruling Tories. She is the first contender to broach the controversial idea, which is consistent with her broader pitch that she is a collaborative politician who brings unique perspectives and attributes to the race. “One of the things that I bring is just the full spectrum of the Canadian experience,” the 58-year-old told The Canadian Press in an interview shortly before officially announcing her leadership campaign on Monday. Murray noted she is also the only contender so far with any decision-making experience in government, having served as a cabinet minister in British Columbia. She said her background leaves her uniquely positioned to balance environmental sustainability and economic growth. She’s a former environment minister, but also a successful businesswoman, who co-founded with her husband a reforestation company that now employs 600 full-time and 600 part-time employees in five countries and which planted its one billionth tree last year. Murray said her company has done business for 35 years in Alberta, where the Liberal brand is almost non-existent and took another hit last week with anti-Alberta comments from Ottawa MP David McGuinty and leadership front-runner Justin Trudeau. She declined to wade into that furor, other than to note that she brings “a western perspective” to the race. Still, Murray is decidedly to the left of most other leadership contenders, who’ve been positioning themselves as business-friendly, “blue” Liberals. She’s an unapologetic advocate of legal marijuana and an ardent environmentalist who favours a carbon tax, although she’s open to suggestions of better ways to put a price on carbon. But her proposal for co-operation with other parties is bound to be the most controversial. Murray sees the idea as a way to get rid of the Tories and start serious reform of the first-past-the-post electoral system to ensure future elections more accurately reflect each party’s popular vote. “Our electoral system is not very representative,” Murray said, pointing out that a party can win a majority of seats in the House of Commons with less than 40 per cent of the popular vote. Worse, she said, the current system “rewards demonizing other parties, it rewards dirty tricks in elections, it rewards toxic, polarized, divisive behaviour in Parliament and it’s turning Canadians off. To make sure Harper is ejected from that seat, she said riding associations need to be able to co-operate with rivals. Murray wouldn’t impose the idea; she’d ask Liberals to endorse it at their next convention, then leave it to local riding associations to decide whether to use it or not. It would be a one-time tactic only for the 2015 election. She stressed she is not proposing a merger with the NDP or any other party. Still, Murray’s openness to co-operation with other parties is risky. It’s bound to spark a backlash from some Liberals who believe it’s a defeatist admission that the party can’t beat the Tories on its own. But it could also help set her apart from the pack chasing presumed front-runner Trudeau, who is widely thought to have a huge head start in the race. Even if Liberals were to embrace the idea, however, there’s no guarantee the NDP and Greens would be willing to go along. NDP Leader Tom Mulcair has adamantly ruled out any co-operation with Liberals, although Green Leader Elizabeth May has been more open to the notion. 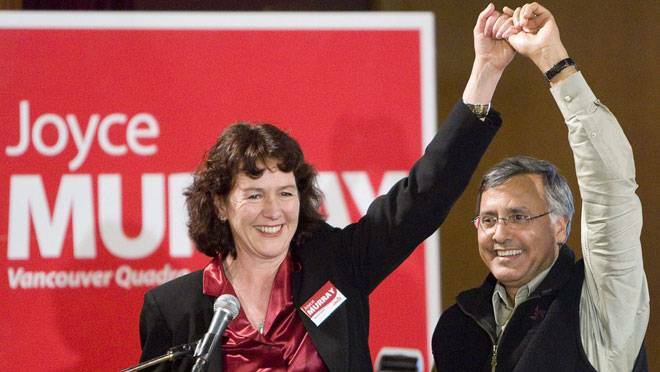 Murray joins a crowded field of contenders, including Trudeau, former Toronto MP Martha Hall Findlay, Toronto lawyer Deborah Coyne, Ottawa lawyer David Bertschi, Vancouver prosecutor Alex Burton and David Merner, former president of the party’s B.C. wing. Montreal MP Marc Garneau, is set to join the contest on Wednesday, while Toronto lawyer George Takach is to follow on Thursday. Ontario government economist Jonathan Mousley is still hoping to enter if he can raise the stiff, $75,000 entry fee. So far, only Trudeau and Coyne have officially registered as candidates, filed the required nomination papers and paid the first of three $25,000 instalments on the entry fee.